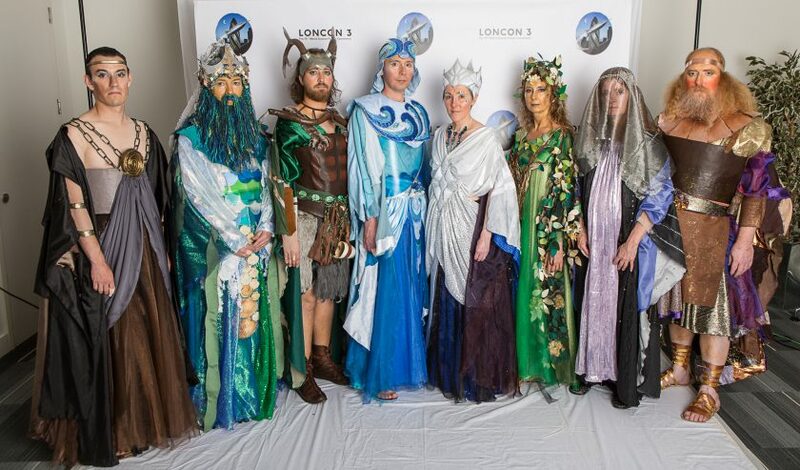 A group of Tolkien Society members triumphed at last weekend’s Worldcon Masquerade, winning Best Workmanship, Best Presentation and Best In Show in the Masters’ category. Congratulations! The entry, entitled Aratalindalë, was inspired by J.R.R. Tolkien’s The Silmarillion. The participants were Ian Spittlehouse, Maggie Percival, Mike Percival, Marcus Streets, Liz Caldwell, Alex Davidson, Lawrence Percival and Helen Armstrong. The costumes were designed and made by Maggie Percival with assistance from Annie Haward, Rae Streets, Mike Towers and the models. Electronic design and manufacture was by Andy Armstrong, Mike Percival, Martin Smith and Marcus Streets, with assistance from Tilly Streets. Perspex work was done by Mike Percival with John Whitbread and Andrew Percival. Beadwork by Laura Taylor. Beads on Yavanna’s headdress made by Hazel Newton. The music was composed by Alex Lewis and the narrator was Martin Smith. Aratalindalë on stage. Photo credit: Lyn Wilshire. Mike and Maggie Percival talk about the costumes and how they were made. Ulmo’s scales pictured. Photo credit: Lyn Wilshire. Varda’s cloak. Photo credit: Lyn Wilshire. The following video offers a brief glimpse of the illuminating performance.